All Purpose: These boxing gloves are Ideal for kickboxing, sparring, heavy bag workouts, and mitt work | Hook & Loop Velcro wrist strap for easy usage of boxing training gloves. Perfect Design: Gel Injected & Multi Layered V-Impact Foam Boxing Gloves Reduces the chance of injuring your fists. High Quality and Durable Sparring Gloves. Anti-perspiration Holes: These punching bag gloves have a breathable Pinhole Palm that offers Increased Hygiene Efficiency Reduces Offensive Odors, Bacteria, Moisture through your hands. Wrist Protection: Extra-thick Supremo-Shock Foam based padding on knuckles of these leather boxing gloves with separate padded block over wrist-joint. 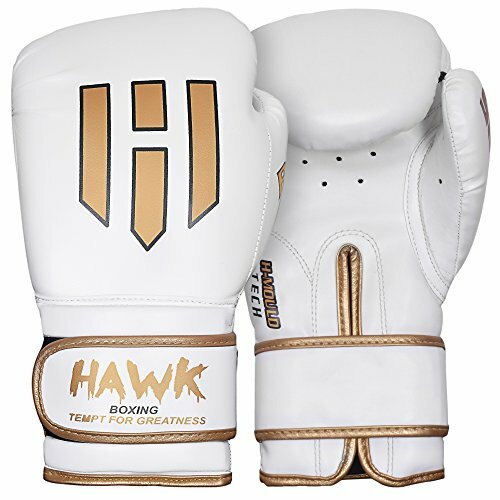 American Sizing: Hawk boxing gloves come in various sizes 8oz for kids boxing gloves. 10oz & 12oz ideal for training, bag and mitt work, whereas 14oz & 16oz is ideal for sparring. For further size guidance please look at the size chart in the pictures. Friendly on every type of skin and is available in Women boxing gloves sizes and with the wide range of Boxing Gloves for men.